So what makes Mutants different, you may ask? At first blush it bears the hallmarks of your typical deck building game. Starting with a hand of basic cards, you build your deck to become stronger with each turn. You battle against other players in order to gain more Prestige points over the course of a set number of rounds until one player stands victorious. The difference is in is the structure of the game. Mutants plays over 5 rounds and each player begins with the same 6 cards in their hand (representing each of the Genetic pools). 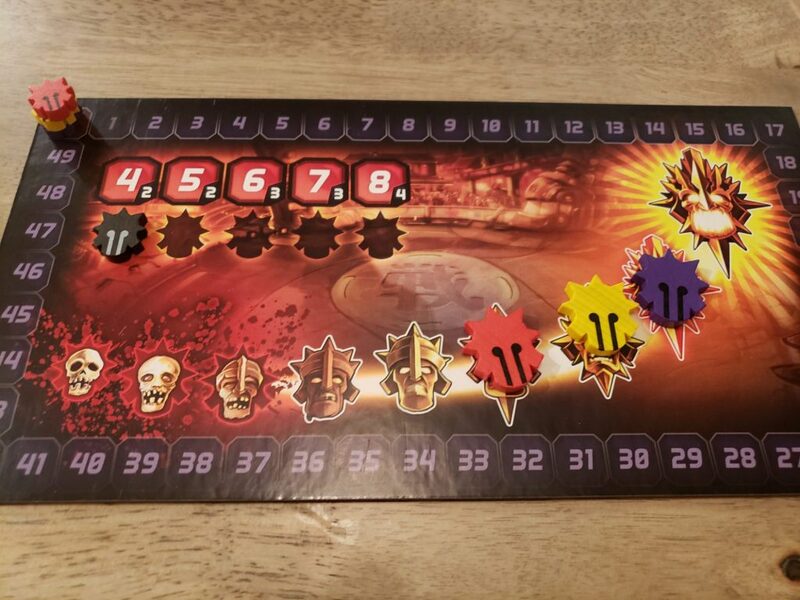 Each person plays their turn in order until everyone has either exhausted their hand or another player is able to Crush the Competition on the board (one of the many unique mechanisms that makes Mutants so intriguing). On each turn, players only take a single action, which means discarding either 2 cards or a single card, based on their choice. This makes for some interesting choices, based on the actions of the cards and the timing of your actions. It also poses some unusual issues, but they may very well be personal and based on the composition of whom is playing. The art on each of the cards, and boards, is truly fantastic. Unique, colorful, and really eye-popping, it captures the essence of these truly terrifying monsters you’re spawning to unleash onto your opponents. Unfortunately, what is missing for me is any form of context: you’re tasked to breed these creatures to get Prestige points and fight for dominance in an unspecific arena, but it’s not clear where, how, or why? There’s an implication this is a sci-fi game, but it’s never explicitly stated; the different Gene pools reflect a myriad of genres (sci-fi, horror, fantasy) and don’t give a sense of time and or place. For some, that really may not be an issue, and it’s something that could easily be explained in the rulebook or filler story, but its lack in the version I played was something I noted. As mentioned above, the game is broken into 5 rounds. Each round is kicked off by the player whose token is in the highest Power track, and goes around clockwise from that player. Determination of who is in the top spot is made at the end of the Round which I will cover a bit later on. The active player will then move the Activate Mutant on their player board to either the left or right slot. They must put the Mutant into an empty slot if available, but if each slot is occupied, that Mutant is then put into the discard pile. Here’s one of the interesting mechanics of Mutants, which I will qualify as a feature AND a bug (which is my feeling on the game in general). When one of your Mutants leaves the Arena in this fashion, this triggers the Leave effect of that card. This can range from increasing your position on the Power track to knocking out an enemy Mutant, but it’s a unique way to enable an effect on your Mutant cards. You have to be very mindful of when that effect will trigger, as it certainly plays into the strategy of how you approach the game. With this in mind, I can offer only one piece of advice: READ EVERY SINGLE CARD. I cannot emphasize this enough. If you are an old-school Magic player or familiar with deck-builders in general, this will certainly come second nature. But if you happened to be playing with folks who may not be as well-versed, it becomes very easy to either overlook or misunderstand the effects the cards have. While this does allow for some pretty interesting strategy, it can also add to frustration to newer players. If you are teaching this to someone who isn’t particularly familiar with this type of game, it would benefit you all to ensure you not only go through the rules, but also the specifics of each card. Once you’ve gotten through the first step of your turn, you move onto the Action phase. 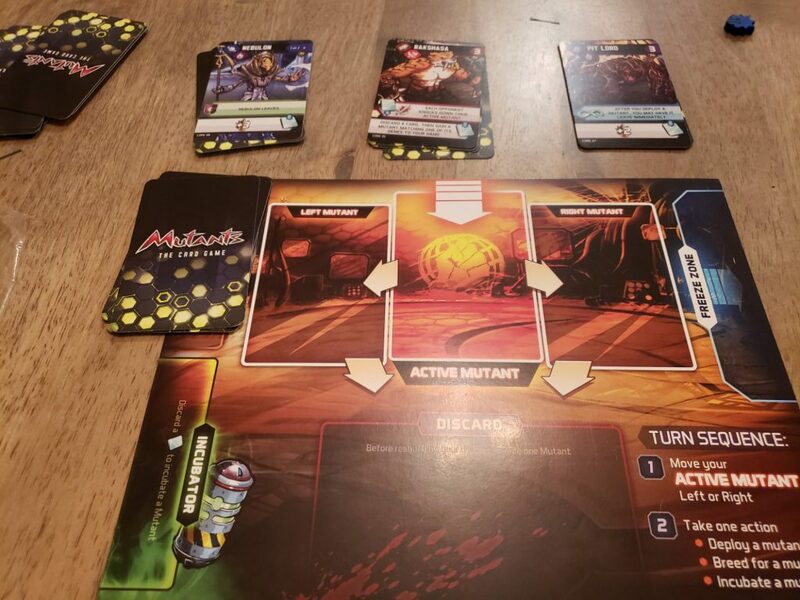 Unlike most deck-builders where you use all of your cards in a single turn, in Mutants you only use one or two, depending on the Action you take. Each Round, you start with 6 cards in your hand (and in the first round, your hand will be ONLY the Basic Mutant cards). Each represents one of the 6 gene types available in the game (Demon, Zombie, Warrior, Robot, Alien, and Beast). You can mix two of those Gene types with the Breed action and take one of the Advanced Mutants in your Gene Pool (3 stacks of 4 cards above the player board which are different for each player (pre-determined Gene Pools are included in the rules but you are encouraged to mix and match to your preference as you grow to learn the game). Breeding a Mutant automatically places the Advanced Mutant in your Active Mutant Slot (which will be open because you moved your Mutant earlier in your turn (see how it all comes together?). 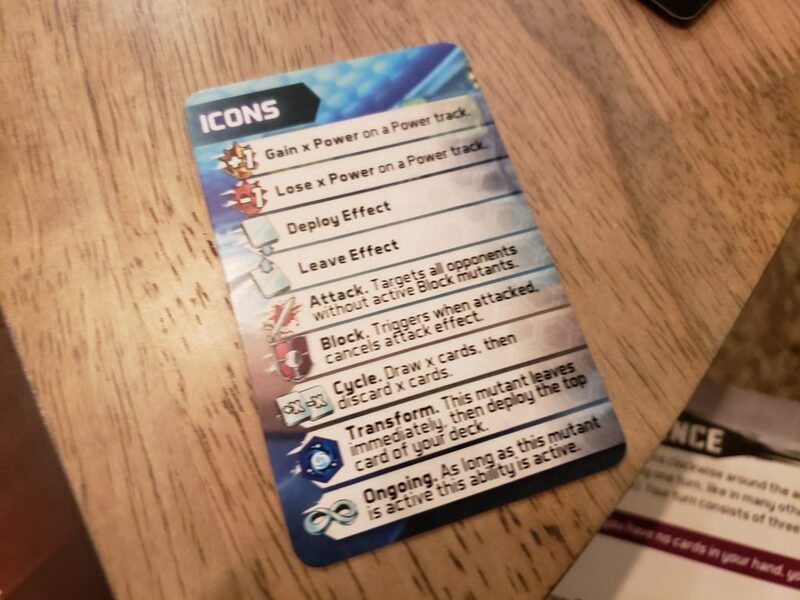 Like the Leave Effect, the Advanced Mutants also have an Arrival Effect that takes place as soon as the card is placed in the Active Mutant slot. Once more for the people in the back: READ EVERY SINGLE CARD. The variable Leave/Arrival powers combined with timing of the selection of the cards will play a significant part of your strategy, so knowing the ins and outs of every card is essential to success (and enjoyment) of the game. If you do not have the cards in your hand to Breed a Mutant, you can discard a single card (of any Gene type) to Incubate one of the Advanced Mutants. You place the desired Advanced Mutant card into your Incubation slot on your player board, and it is then placed at the top of your Draw Deck at the beginning of the next Round. You can only incubate one Mutant at a time, so which Mutant to incubate and when is a very crucial decision. Another advantage of this action is you not only increase the potential power of your hand for the next Round, but you’re also only using a single card, which allows for more potential actions the remainder of the Round. The third Action available is to Deploy a Mutant, Advanced or Basic. This places a Mutant in your Hand into the Active Mutant slot, and you take the applicable Arrival effect(s). It’s worth noting here that, in addition to Arrival and Leave effects, some Mutants have ongoing effects. This means that as long as they are on your board, whether in the Active slot or the Left/Right slot, that effect will impact whatever your choice may be. This could be a significant advantage as it may enhance your Power track, knockout other players’ mutants, or give you additional cards when you take certain actions, but as a wise man once said: READ EVERY SINGLE CARD. Ultimately, that’s the game. As I mentioned, this is sort of a feature and a bug. 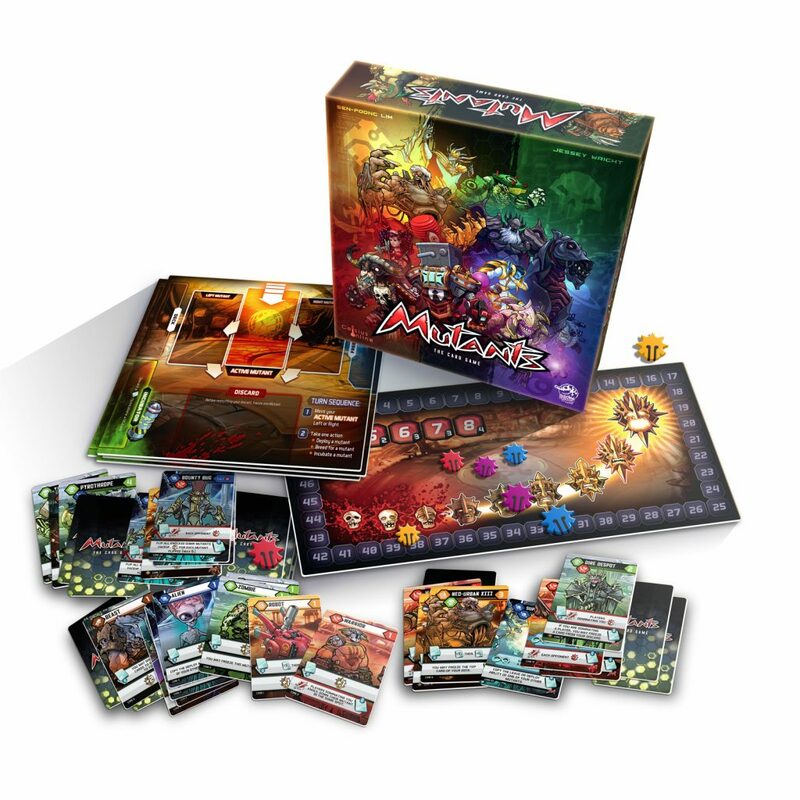 Mutants isn’t that complex, but the variance in the card powers and when they are enabled means you really need to be mindful of what they are, when they are played, and what other players have on their boards. Some Mutants have combat effects,, some have Block effects, some leave as soon as they arrive (FRIEND, STAY!!!). All of this is in service of being highest on the Power track at the end of the Round, which determines how many Prestige (VP) points you get. The goal of the game is to jockey for position throughout the course of a round. And you have a finite number of cards to work with as you can only play 1 action per turn, so timing and knowledge of the cards is crucial. You’ll see many folks praise the asymmetrical nature of the game: the unique combination of the Gene Pools decks from which you draw your Advanced Mutants, and all of the cards needed to deploy your personal strategy. That particular aspect of the game is really interesting, as is the single action per turn. You also need to effectively time the play of your cards in order to stay near the top of the Power track at the end of a turn. However, the player to your left may just have a strategy that will blow yours out of the water, rendering all your best laid plans moot. That’s the nature of this type of game, so it’s to be expected. The issue I have is that while the single action idea is really interesting, it really doesn’t kick in to full effect until the 3rd Round, and by that point, you’re over halfway through the game. That may be by design, and after further plays I may change my mind and decide that’s absolute genius. My biggest gripe is that it was quite frustrating at times and took a bit too long to get into the swing of things. I’m no deck-builder aficionado, but I recognize there are some really unique ideas at work here. For more seasoned players of this type of game, Mutants will hit that sweet spot that so many people seem to really relish. A midwest Native (by way of Chicago, Los Angeles, Seattle and Austin) currently residing in Boise, Idaho, Scott spends his days working in project management and spreadsheets aplenty. While tabletop games and RPGs were ever-present in his youth, the intervening years were filled more with video games. Only recently (2013) got back into boardgaming in earnest, and now cannot get enough. His favorite games are The Gallerist, Lords of Waterdeep, and any heavy game he can get his hands on.